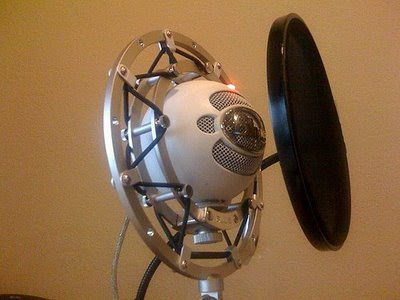 Fancy yourself as a podcaster? I've always had a secret desire to host my own radio show and with the advent of relatively cheap podcasting kits maybe this is the time to give it a go! That said I haven't always been comfortable with the idea of recording and listening back to my own voice. I think I was about 19 when someone suggested my voice might sound good on the radio but at the time I was yet to leave my first answer phone message for fear of my voice sounding silly so any dream I held of hosting a radio show was light years away. Finally a good friend purposely stopped answering her phone when I called so that I had to leave a message. It worked, and I have now lost at least part of the fear of hearing my own voice. A few years later, while I was working for a large IT company, I was asked by a colleague who was working on a project providing an automated phone answering system whether I would like to be THE recorded voice for his system. He said he had heard me talking in the office and thought my voice would work well. A little taken aback and chuffed to have even been considered, I took him up on his offer and started recording. I was very nervous at first, it was a little intimidating sitting in a room with lots of business men listening to playback of your voice, but it ended up being great fun and for a while I was the voice of the MOT helpline in the UK. I've also had a brush with being a weather presenter during a random training session in some BBC studios. It was just the same set up as you see on TV; I was standing in front of a blank screen pointing at imaginary clouds and cold fronts reading off a monitor whilst being filmed. I got to keep the recording afterwards but I think that actually seeing myself on TV and hearing myself at the same time was beyond my comfort zone. The DVD is now hidden under a pile off other DVDs, unlabelled, and will probably come back to haunt me one day when I least expect it. I'm sure I will respond with a hot flush and a quick dash towards the door. I also spotted a fantastic new recording device unveiled at CES this week called the Zoom H4n mobile audio recorder. This device should be very useful for podcasters, journalists and musicians. Read all about it here. Have you ever recorded a podcast? Can you offer any advice to anyone starting out? I love radio, and am on it here in Amsterdam every now and again, mostly babbling about blogging and activist politics. My advice? Prepare, keep it simple, and learn to keep talking when you have to. Your audience will respect you for your clarity and tone, as much as for your content. That's great that you go on radio in Amsterdam! Very cool! Thanks for the advice, now I have to research how I can include music in a podcast without infringing on copyright laws etc. Yep, would be a nice thing to try in 2009. Kling Klang News: Bye Bye Florian!